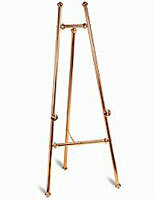 This Brass Easel is Perfect for Hotel Lobbies, Art Galleries, and Other Sophisticated Display Areas! Pick from Tons of Styles, Sizes, Finishes, and Materials! Order the Brass Easel Now to Add a Refined Touch to Any Outfit! 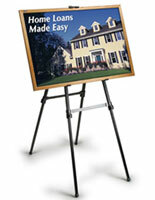 This brass easel is commonly seen in hotel lobbies and convention centers. The tripod design features a high quality steel construction with a brass plated finish. 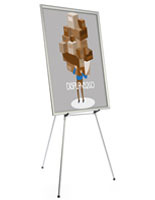 This brass easel is 6' tall making it the ideal size to display such items as posters, artwork, menu boards and other signage. Display directories, messages or paintings at various heights. Each brass easel has a fixed height of 6 feet tall; however there are support brackets at four heights. Users can choose to set the bottom of a display as low as 24" off the ground or as high as 54". 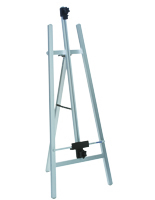 Each brass easel can be easily folded up and stored. The closed dimensions are 1" wide x 4" deep x 72" high and weigh 6 lbs. 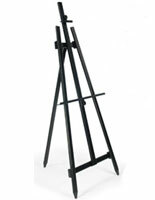 If you are looking for a brass easel that is great looking, sturdy, lightweight and affordable, this is a great choice. Each of the three legs on this unit features a rubber cap to minimize markings on floors. The feet also help to maintain the overall stability of this brass easel. There is also a middle support that locks in place once the tripod is in place. 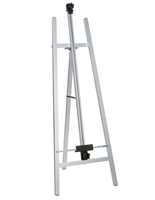 When not in use, this brass easel can be folded and placed in a closet or in a storage facility. 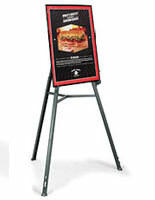 This stand is a popular choice among hotels and other hospitality resorts to post welcoming signage or restaurant offerings in the lobby or dining area. 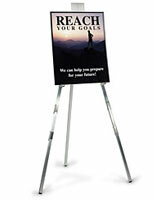 Buy this brass easel for your business or organization today.